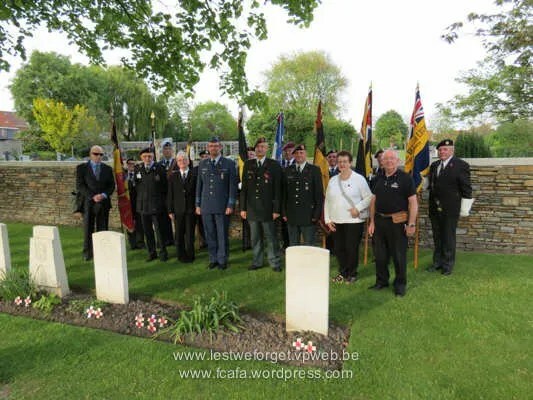 On the 5th May, a modest remembrance ceremony traditionally organised by the Lest We Forget Battlefield Tours (Flanders) company, took place in the Ypres Town Extension CWGC cemetery in Belgium, commemorating the ill fated RAF Operation Circus 157, during which 4 RAF Spitfire pilots lost their lives on the very same days 72 years ago: they were the Brit – F/Sgt S Jones, the Belgian F/Lt B de Hemptinne, the Canadian Sgt J Ribout and the Czech Sgt Karel Pavlík. 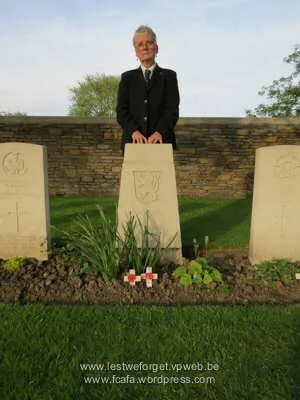 5. května se uskutečnila malá pietní akce, tradičně pořádaná společností Lest We Forget Battlefield Tours (Flanders), na vojenském hřbitově Ypres Town Extension CWGC v Belgii, na paměť fatální RAF Operace Circus 157, během které 4 RAF piloti Spitfirů přišli o život v ten samý den před 72 lety: Brit F/SGT S Jones, Belgičan F/Lt B de Hemptinne, Kanaďan SGT J Ribout a Čech SGT Karel Pavlík. 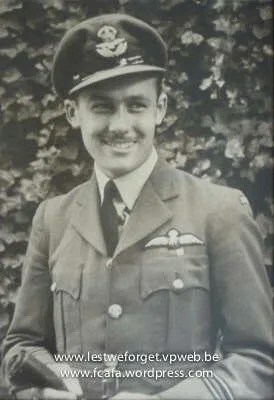 Commemorated was also the Czech S/Ldr F Fajtl, who was shot down during this Operation as well, but crash-landed, survived and re-joined the RAF three months later after a dramatic escape across the continent. Vzpomněli jsme také SGN/Ldr Františka Fajtla, který byl taktéž sestřelen v Operaci Circus 157, ale podařilo se mu přistát a po dramatickém tříměsíčním útěku přes kontinent se dostal zpět do Británie a k RAF. Své zážitky popsal ve známé knížce “Sestřelen”. We also paid homage to the last Belgian WW II RAF Spitfire pilot Robert “Bobby” Lauman, who died on 21st April 2014, aged 93. Uctili jsme i památku posledního belgického druhoválečného RAF pilota Spitfiru Roberta “Bobbyho” Laumana, který zemřel 21.4.2014 ve věku 93 let. 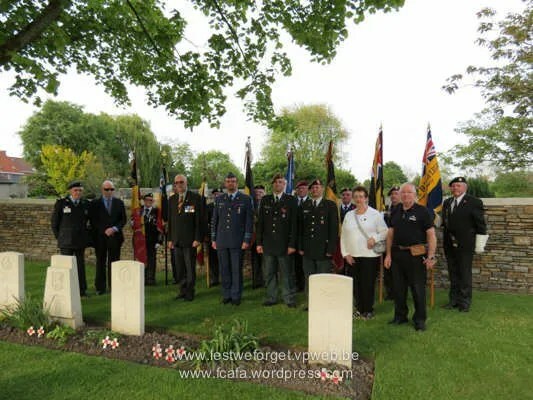 The ceremony was attended by Lt Col F Borremans – the commander of the Ypres military logistics centre, Belgian military reserve officers as well as eight standard bearers representing the local veterans´associations, members of the RBL Stevenage Branch Mr and Mrs Mott and Mr. Morley on behalf of the RBL Ypres Branch. Na pietní akci byl přítomen Lt Col F Borremans, velitel vojenského logistického centra v Ypres, belgičtí důstojníci v záloze, osm vlajkonošů místních veteránských organizací a také pan a paní Mottovi za Royal British Legion Stevenage Branch a pan Morley jménem RBL Ypres Branch. After an introductory speech, poppy cross tributes were placed at the graves of the fallen pilots and the four national anthems were played. Po úvodním projevu byly k hrobům padlých pilotů položeny křížky s vlčími máky a byly zahrány čtyři státní hymny. 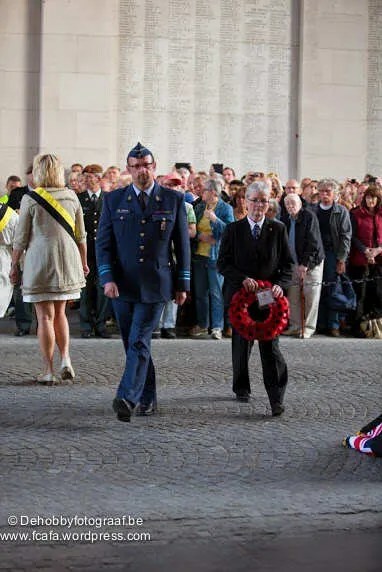 Then all the present proceeded to the Menin Gate Memorial to the Missing, where a wreath was placed on behalf of the RAF pilots fallen during Operation Circus 157. Poté se všichni účastníci odebrali k památníku nezvěstným padlým – Meninské bráně, kde byl položen věnec na paměť padlých pilotů Operace Circus 157. I was born in Ypres, as my father was an ex serviceman from the 14-18 war, who worked for the War Graves Commission. 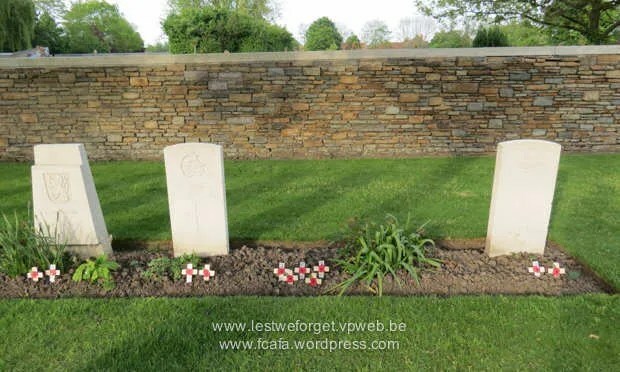 We lived opposite Resevoir Cemetery and 5 mins from the Menin Gate.